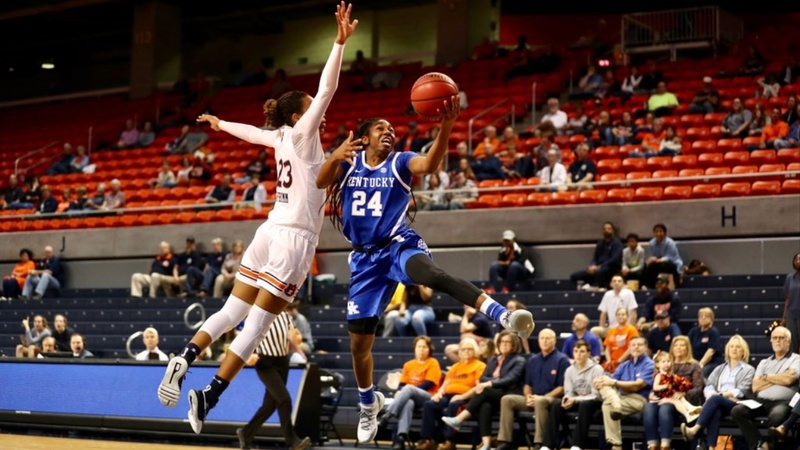 The Kentucky Wildcats took down the Auburn Tigers on Thursday night behind an impressive performance from the three-point line. The Cats knocked down their first eight triples and ended the night hitting 11 of 20 (55%) from behind the arc. Kentucky was efficient inside as well as they ended the night 28 of 54 (51.9%) from the field. The game was decided at the three-point line. While Kentucky knocked down eleven, Auburn was only able to convert 2 of 11 (18.2%) of their three-point attempts. In addition, the Tigers shot 42.3% from the field, knocking down 22 of their 52 shot attempts. Auburn had a pair of early leads (2-0, 4-3) before Kentucky’s onslaught from behind the arc got going. UK got back-to-back three-pointers from Maci Morris and Rhyne Howard to take a 9-4 advantage. The Cats would lead by 8 points on two different occasions, including a 22-14 lead late in the first quarter before Auburn would score four straight points to close out the period. Auburn started off the 2nd quarter by cutting Kentucky’s lead to just two. Kentucky answered with a 14-0 run, including threes from Howard and Taylor Murray to take a 16-point lead, 36-20. The Tigers would get within 13, 38-25, but Kentucky would hold a 42-28 lead going into the locker room. In the third quarter, Auburn attempted to chip away at the lead, but Kentucky would hold them at bay. Auburn did cut the lead down to 10 on two sperate occasions, but each time they got close, the Cats had an answer. Kentucky made five straight free throws to close the third quarter with a 64-48 lead. Just like they did in the third quarter, Auburn spent early portions of the fourth quarter trying chip away into Kentucky’s lead. The Tigers did back within single digits, cutting the advantage to 72-63 before Howard answered with her fifth three-pointer, increasing the lead to 12. Auburn wouldn’t get within single digits and Kentucky won 78-68. Kentucky returns to action Monday visiting Alabama. Tip-off is set for 7 p.m. ET and can be seen on SEC Network.